For patients with early stage breast carcinoma, the ability to achieve complete tumor resection with breast conservation therapy (BCT) remains imperfect despite advances in surgical, pathologic and imaging techniques. The goal of BCT is to remove a patient’s breast cancer with negative surgical margins while achieving a cosmetically acceptable result. The presence or absences of malignant cells on the edge or close to the edge of a lumpectomy specimen is called the surgical margin, and it serves as a marker of residual disease in the breast. Currently re-excision rates to achieve clear margins in the United States range between 15-40%. The negative impacts of re-excision include delays in the completion of adjuvant therapies, increased infection rates, increased health care costs, increased mastectomy rates and negative psychological impacts on the patients. 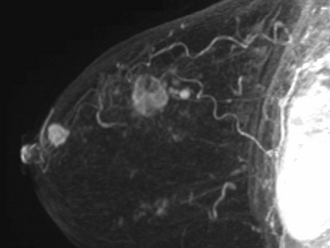 The principle of clear margins is imperative since presence of positive margins is associated with increased loco-regional recurrence, and the failure to maintain local control is associated with a decrease in long-term breast cancer specific survival. In AMIGO, we are studying the use of novel intraoperative mass spectrometry and magnetic resonance imaging (MRI) as methods to detect residual cancer in the hopes of reducing the rates of re-excision for breast cancer patients. AMIGO enables surgeons to incorporate existing and novel imaging technologies including intraoperative MRI and mass spectrometry, to efficiently and precisely guide treatment — before, during, and after surgery — without the patient or medical team ever leaving the operating room. It is our hypothesis that utilizing intra-procedural mass spectrometry and breast MRI will allow for improved visualization and characterization of tumors and breast-tumor biomarkers that will be effective in assessing tumor margins and areas of residual disease. Ultimately we hope that implementation of these advanced imaging technologies during breast surgery will allow surgeons to achieve more precise excisions and successful first-surgery clear margin rates, ultimately hopefully avoiding the need for further operations. If you are a patient and would like to learn about the offerings of AMIGO, please visit the BWH AMIGO page. Review the clinical trial here. Diagnostic Imaging. 3D volume rendered MIP images showing the main mass and satellites. The presence of satellite tumors poses a difficulty in ensuring complete tumor resection. Diagnostic Imaging. 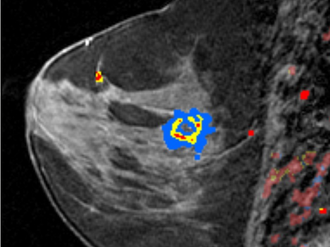 Color overlay by a Computer-aided software over the rapidly enhancing mass (invasive ductal cancer). Preoperative. In the AMIGO operating room the patient is placed under general anesthesia. A contrast enhanced 3D MRI then is performed while the patient is in supine position. In this case, an MRI is performed before and after contrast injection, delineating the tumor boundaries in relationship to fixed landmarks. Upon completion of the preprocedural MRI, the MRI machine leaves the room and the images are evaluated. Intraoperative. The woman's breast is then prepared and draped in standard sterile fashion. Through palpation, the tumor is identified and surgical incisions marked. Intraoperative. As part of the lymph node evaluation procedure, marcaine and 2cc of 1% methylene blue diluted with 3cc of saline are injected. The breast is then massaged to distribute the methylene blue to the lymphatics before beginning the incision between the pectorals and latissimus muscles, below the marked line. Intraoperative. The methylene blue renders the sentinel lymph nodes detectable. The lymph nodes sent to pathology for evaluation. After the lumpectomy is performed, the resected tumor is sent to pathology. Intraoperative. The lumpectomy cavity is temporarily closed with a nylon suture. Intraoperative. 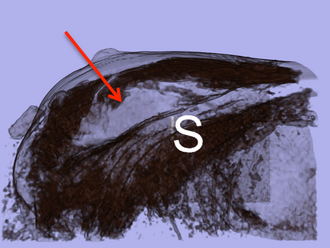 Before completing closure, the lumpectomy cavity is filled with exact volume of resected tumor and a 1cm margin. Finally, the incision is covered. Postoperative. Immediately post-surgery, a second MRI scan (again, with contrast) is obtained while the patient is on the operating table. The purpose of this MRI is to examine the saline filled cavity to identify areas of enhancement that may be suspicious for residual carcinoma. Following the imaging, the MRI scanner leaves the operating room. A radiologist compares the resected tumor to an MRI of the second breast for possible areas of residual tissue. On the left side, the preoperative images are shown; on the right side, the new images are displayed. Postoperative. Post-surgical post-contrast MRI showing the saline cavity filled with saline. Postoperative. 3D volume rendered image showing the surgical cavity. Re-excision. If suspicious remaining tissue is detected on the MRI images, the breast is reopened and the residual tumor removed. Contrast-enhanced breast MR imaging is increasingly being used to diagnose breast cancer and to perform biopsy procedures. The American Cancer Society has advised women at high risk for breast cancer to have breast MR imaging screening as an adjunct to screening mammography. This article places special emphasis on biopsy and operative planning involving MR imaging and reviews use of breast MR imaging in monitoring response to neoadjuvant chemotherapy. Described are peer-reviewed data on currently accepted MR imaging-guided procedures for addressing benign and malignant breast diseases, including intraoperative imaging. 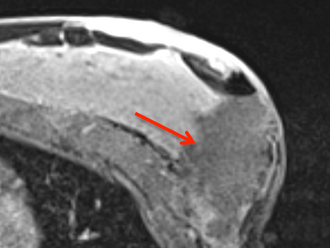 BACKGROUND: The rate of reexcision in breast-conserving surgery remains high, leading to delay in initiation of adjuvant therapy, increased cost, increased complications, and negative psychological impact to the patient.1 (-) 3 We initiated a phase 1 clinical trial to determine the feasibility of the use of intraoperative magnetic resonance imaging (MRI) to assess margins in the advanced multimodal image-guided operating (AMIGO) suite. METHODS: All patients received contrast-enhanced three-dimensional MRI while under general anesthesia in the supine position, followed by standard BCT with or without wire guidance and sentinel node biopsy. Additional margin reexcision was performed of suspicious margins and correlated to final pathology (Fig. 1). Feasibility was assessed via two components: demonstration of safety and sterility and acceptable duration of the operation and imaging; and adequacy of intraoperative MRI imaging for interpretation and its comparison to final pathology. Fig. 1 Schema of AMIGO trial RESULTS: Eight patients (mean age 48.5 years), 4 with stage I breast cancer and 4 with stage II breast cancer, were recruited. All patients underwent successful BCT in the AMIGO suite with no AMIGO-specific complications or break in sterility during surgery. The mean operative time was 113 min (range 93-146 min). CONCLUSIONS: Our experience with AMIGO suggests that it is feasible to use intraoperative MRI imaging to evaluate margin assessment in real time. Further research is required to identify modalities that will lead to a reduction in reexcision in breast cancer therapy.